Israel And The West Bank Through Fresh Eyes : Parallels A dozen photographers were set loose with the aim of seeing an old conflict in a new light. 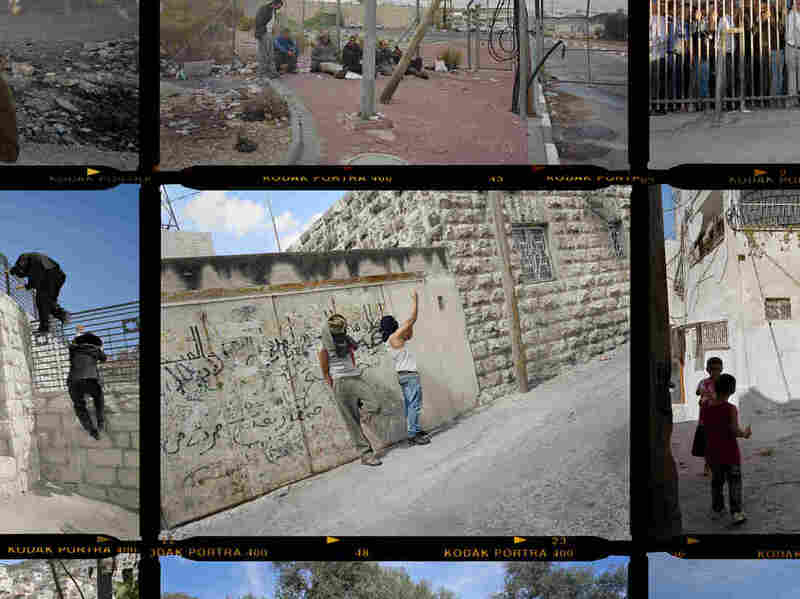 The result is a photo exhibit now showing in Tel Aviv and coming soon to the U.S.
A dozen internationally acclaimed photographers were set loose in Israel and the West Bank. Most had never been in either place before. The aim was to try to see anew a part of the world that's been thoroughly photographed, long mythologized and often fought over. The project's creator is Frederic Brenner, a French photographer perhaps best known for his documentation of the global Jewish diaspora. And the result is This Place, a photo exhibit now showing in Tel Aviv and coming to the U.S. later this year. As the project started, Brenner found himself in a scene he'd shot before — a Hasidic Jewish family sitting down to a Sabbath meal. 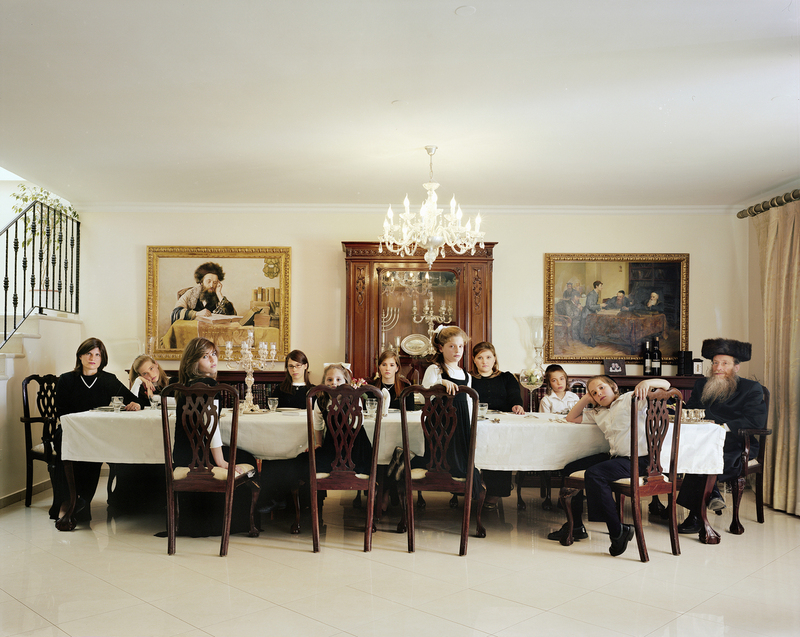 The Weinfeld Family, 2009. Photographer Frederic Brenner, who took this photo, created This Place, an exhibit that features the work of 12 internationally acclaimed photographers in Israel and the West Bank. "And I see this, what I would call this dream already dreamt," Brenner said, with the sense of sweeping metaphor that laces both his speech and his art. The richness of the room, the longest dining room table he'd ever seen and the fact that the family would change soon with their daughter's marriage all caught him. "There were so many layers. And I thought during the meal, 'Whoa, I need to make a photograph of that,' " he said. The family's portrait is in the exhibit. But Brenner's real focus was to find images that deviated from the familiar Israeli and Palestinian narratives. He calls This Place an attempt to look beyond the binary. "For Israel, against Israel. Victim, perpetrator. An attempt to look beyond the political narrative," Brenner said in an interview in the Tel Aviv Museum of Art, where the show runs until early September. "To invite artists to question those constructs in which we are trapped and in which we force people to be trapped," he added. He recruited 11 other photographers, paired them with local assistants, introduced them to diverse people then let them run free. During a panel discussion around the Tel Aviv show opening, an audience member questioned Slovak photographer Martin Kollar about his images of an Israel she had never imagined. "Where have you been?" she asked. "These photos I cannot recognize at all." Kollar's photos are bizarre, and he provides no captions either in the exhibit or in the book of his work in Israel and the West Bank. 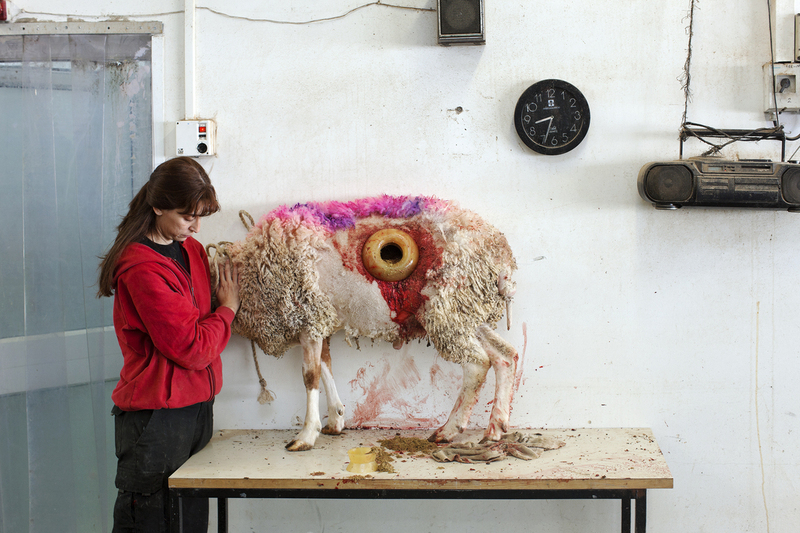 An image of a sheep with a hole in its stomach and another of a woman with tubes and rods attached to her face caught the attention of the audience member questioning him. "It looked like Israel is like a freak, kind of freak industrial place," she said. Kollar said he spent a lot of time at Israeli scientific research institutes and some military installations. Another photographer, American Wendy Ewald, gave cameras to people from a dozen distinct communities. She began with Arab Israeli middle-school kids from Nazareth, and says that through them she saw things she, too, had never seen before. "The kitsch of the culture, for one thing. And also the sense of playfulness," she said. "I think the images I had seen had been really focused on the idea of what the conflict was." When Ewald showed some of those Arab Israeli students around the exhibit, she asked them to choose a photo that they found especially compelling to discuss. An image by French photographer Gilles Peress, who has worked extensively in conflict zones, including Bosnia, Northern Ireland and Rwanda, stood out to Adi Bahdra. It shows two young Palestinian men, their faces hidden, gesturing in front of a graffiti-covered wall. Bahdra says they are confronting Israeli soldiers, and it makes him feel proud. "And they have nothing, and the Jewish soldiers have guns and everything. It is brave to be in front of them," he said. Ewald also gave cameras to Israeli military recruits, high-tech workers and Palestinian women. Editing them for the exhibition, she kept images from each community intact rather than mix them with another. "To acknowledge that all of us have distinct cultures and distinct ways of seeing the world is important," Ewald said. Other work includes Nick Waplington's collection cataloging the diversity of Israelis living in settlements in the West Bank, which most of the world considers illegal; Rosalind Fox Solomon's portraits of people in Israel's underclass; and Josef Koudelka's view of the world around the separation barrier, part tall concrete wall, part electronic fence, that Israel built in and around the West Bank in response to suicide attacks. American photographer Fazal Sheikh used 1948, the year Israel was created, as his anchor. In a trilogy of projects, he interviewed old combatants from both sides of the 1948 conflict, paired photographs of one Israeli and one Palestinian born each year since then, and got in a plane to document how Israel's desert landscape has changed. What he saw were painful divides, a collective wound, he says, that has been rendered on both communities. "You kind of feel that wherever you go," Sheikh said. "If you're at all sensitive you feel that there's some forbidding. Something unresolved, and something sort of still festering." 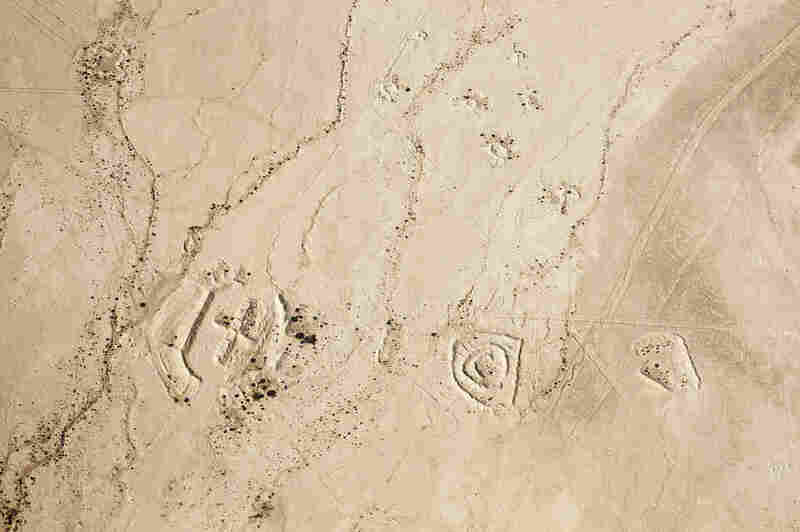 That may not be new insight to this well-documented place. But in his aerial shots especially, it's not clear at first what you're seeing. That's what this exhibit is aiming for overall — something familiar seen differently. The exhibit, This Place, is currently at the Tel Aviv Museum of Art through Sept. 5. It will be at the Norton Museum of Art in West Palm Beach, Fla., from Oct. 15 until Jan. 17, 2016. The exhibit will be at the Brooklyn Museum beginning in February 2016.